Elgiz Museum (Proje4L) of Contemporary Art in Istanbul's busy business quarter Maslak surrounded by uniquely shaped skyscrapers interprets today's hectic working life with a temporary sculpture exhibition "Plaza Worker," which took its name from British sculptor Sean Henry's work representing a businessman figure painted in bronze. At the exhibition venue, Olivier Blanckart's cardboard sculpture "Citizen" shows the clear distinction between blue- and white-collar workers, although both sides exert the same effort to earn their livings. The exhibition employs a satirical approach as much as the museum with a rooftop facing giant glass towers housing thousands of officers from 9:00 a.m. to 06:00 p.m. or even longer hours. At the entrance, Henry's sculpture - a male officer in his grey suit reclining, using his briefcase as a pillow - is the first thing that leaps to the eye. He has taken off his shoes and socks and is barefoot. Curator Haşim Nur Gürel said in his review that Henry's office worker is either sleeping or resting for the next day on a high coffin rest-like pedestal, suggesting thought-provoking and unfavorable interpretations. The life-size sculpture is reluctant-looking but is positioned in a way as if he was going to put on his socks and shoes, get a cup of coffee and be at his desk at 9:00 a.m. Occupying public and private areas in different cities of the world, Henry's sculptures, in his own words, reflect "the tension between the making and staging of figures that seem to belong to the real world and the degree to which they echo our experiences and sympathies." He models his sculptures in clay before painting with oil and other paints. His work was the subject of "CONFLUX: A Union of the Sacred and the Anonymous" at Salisbury Cathedral, Henry's largest exhibition to date, which attracted over 100,000 visitors during its four-month run in 2011, a record for the cathedral. Plaza Worker continues with other former and new acquisitions of the Elgiz Museum, bearing similarities with Henry's sculpture. "Kral Übü" (King Ubu) by Çağdaş Erçelik is presumably the next most commendable work of the ongoing exhibition. Inspired by French symbolist author Alfred Jarry's namesake play (Ubu Roi), the sculpture attacks the idea of power, greed and self-gratification, all of which can be seen in business life. When you walk a little more, Brussels-based Olivier Blanckart's cardboard-made sculpture "Citizen" will bring another dimension to the main idea that evolve in your mind. 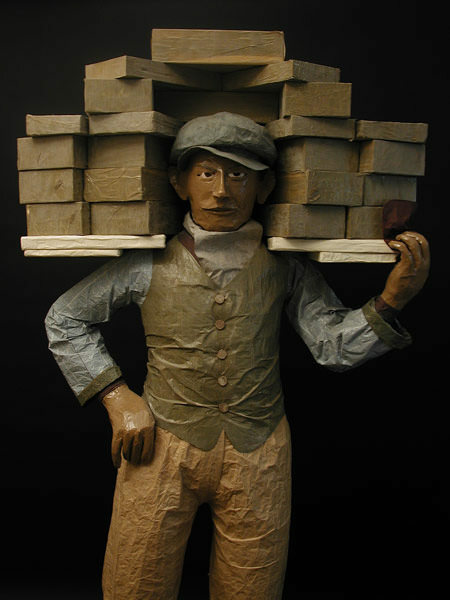 Wearing a flat cap, the sculpture carries a number of brick stones on his shoulders. The "Citizen" reminds the clear distinction between blue and white-collar workers, although both sides exert the same effort to earn their lives. By the way, Luis Vidal's "Lindo IV" featuring a small angry man essentially deals with the same concerns of stressful working environment. "All works deal with the plaza worker's loneliness and despair," Gürel continued. Other works chosen for the temporary exhibition space as well as some others displayed under the name "Skyline" on the museum terrace are also recommended for visitors to see. 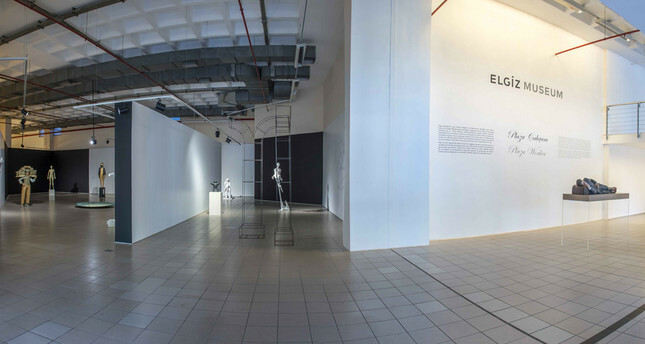 Elgiz Museum was founded by Sevda and Can Elgiz as a contemporary art space in 2001. Extending an area of 2000 square meters, the museum supports the development of contemporary art with an international identity. The Elgiz Museum houses the family's collections and hosts dynamic, avantgarde, temporary exhibitions along with educational programs.